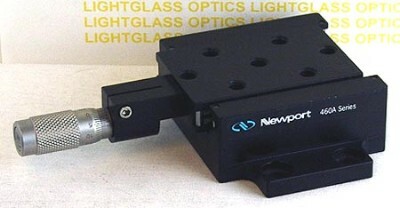 The Newport 460A-X High-Performance Linear Ball-Bearing Linear Stage is a single-axis linear stage and part of the 460A series which is made of aluminum and has precision-ground rods on which the hardened ball-bearings ride. This series of stages is modular and can be assembled in a variety of ways to serve your requirements. The Newport SM-13 actuator is included.